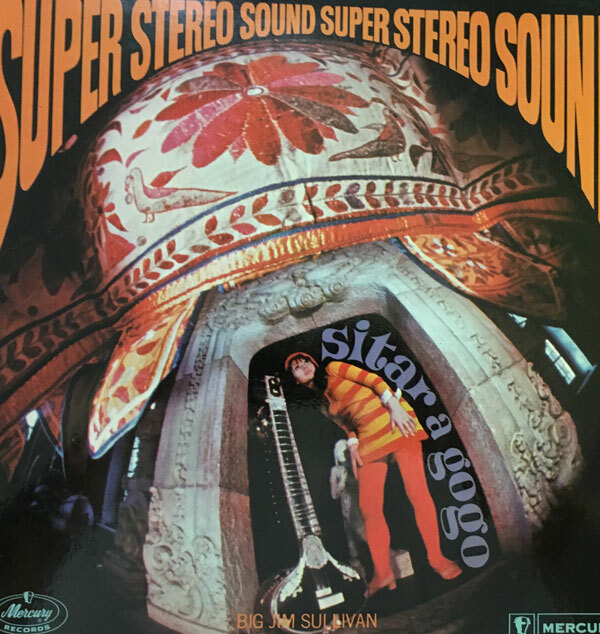 The tune I bring you today is a very groovy cover version from one of the coolest sitar albums of the 60s. 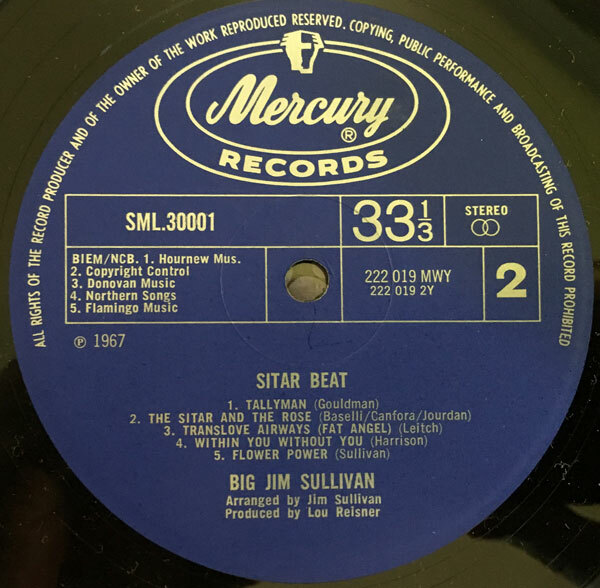 Big Jim Sullivan (nee James George Tompkins) was one of the most in-demand UK session guitarists (alongside”Little” Jimmy Page) of the 1960s, playing on all manner of pop/rock/easy sessions as well as being part of Tom Jones’ band. His cover of the 1967 Jeff Beck hit ‘Tallyman’ (written by none other than Graham Gouldman) hails from the UK LP ‘Sitar A Go Go’, which was released here in the US as ‘Sitar Beat’. Though everyone was trying to cash in on the musical move Eastward, either by adding a sitar to their mix (like the Beatles and pretty much everyone else) or working the sitar into a pop context (like Rajput and the Sipoy Mutiny or Ananda Shankar, or as Sullivan did in another guise, Lord Sitar) Big Jim Sullivan managed to do so with a substantial amount of style and imagination. As a result, ‘Sitar A Go Go’ manages to work as good music in spite of its exploit roots. The tracks on the album move between rock, pop and more reverential Indian sounds, but ‘Tallyman’ is without a doubt the grooviest selection. Working in fuzz guitar, sitar, table and a bright brass section, as well as a groovy flute solo, ‘Tallyman’ is a great example of the kind of stylish, colorful things that UK studio heads were cranking out in the 60s and early 70s. It almost crosses over into Library territory. If you desire your own copy of the album but don’t want to spend the time or money looking for an original, ‘Sitar Beat’ was reissued on CD with bonus tracks. We have delved into the world of “Easy” a great deal over the years here at Iron Leg. As was discussed at length back in ‘The Party’, I have a great appetite for the intersection of Squaresville and Coolsville, especially when it arrives courtesy of mainstreamers attempting to co-opt, or at least interpret the sounds of the younger generation. Sometimes this is a deliberate approximation of that world to create a mood in a movie or TV show (i.e. Mancini, Vic Mizzy etc) or it is a reinterpretation of pop/rock material for home uses, i.e. easy listening LPs meant for oldsters, Hi-Fi enthusiasts etc, in which we get to hear the songs that the kids dig in a mellower, easier to digest format meant to come wafting into your den as you sip cocktails with your guests. Today’s selection falls into the latter category, and is an especially tasty example of the form. 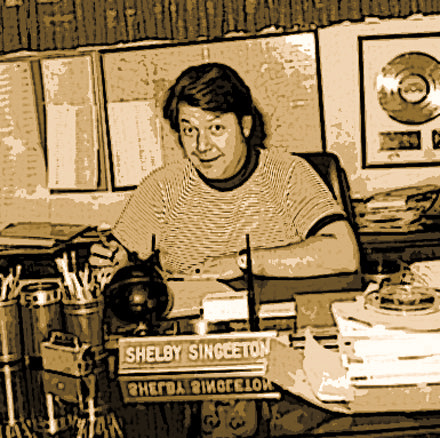 From what I can tell, arranger Larry Wilcox did most of his work in the mainstream pop world, working on sessions for Top 40, but generally short-haired types with the occasional hip session (sides for Dionne Warwick, Betty Wright and Aretha Franklin) mixed in. 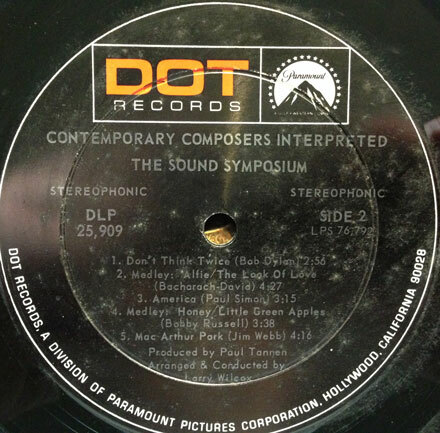 During the mid-to-late 60s he arranged a string of albums for Dot Records under the name of the Sound Symposium, including ‘Paul Simon Interpreted’ (1968), ‘Bob Dylan Interpreted’ (1969) and the disc which yielded today’s selection ‘Contemporary Composers Interpreted’ (1968). Unlike a lot of similar efforts, the Sound Symposium albums seemed to have been aimed at a slightly high-minded demographic, i.e. a somewhat hipper (yet not hip/young enough to grab the real thing) crowd. Oddly enough, even though they did whole album devoted to Paul Simon, the version of ‘America’ was not included on that (though I wouldn’t be surprised if it came from the same session). ‘America’, which first appeared on Simon and Garfunkel’s ‘Bookends’ album lends itself well to this kind of interpretation, already being qquite mellow. 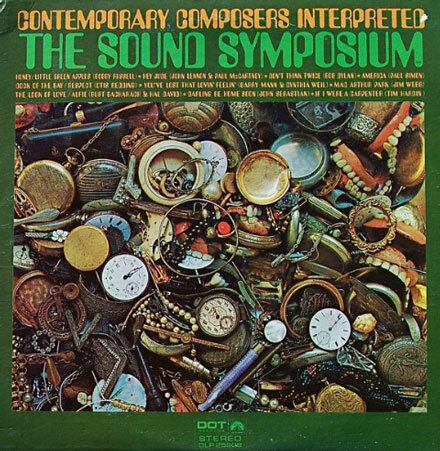 The Sound Symposium version leans heavily on the strings/woodwinds of the orchestra with just enough ‘plugged-in’ sounds (drums, electric guitar) to keep it interesting. The arrangement by Wilcox is quite nice, indicating a certain sympathy with the material and more focus than the usual easy session. The horn touches, tremolo guitar and percussion are all well done and make for a pleasant and interesting listening experience. The version of the Lovin’ Spoonful’s ‘Darling Be Home Soon’ (one of my favorite songs) has some very nice production touches (the subtle panning of the strings in the beginning of the song is very cool), and the use of xylophone in counterpoint to the strings (actually two separate string lines playing side by side) is cool. The producer, Paul Tannen seems to have followed a similar trajectory to Wilcox, working mostly with mainstream pop artists through the 1960s. I’d still like to find the Paul Simon/Bon Dylan albums by the group. Welcome to this month’s episode (#47) of the Iron Leg Radio Show. 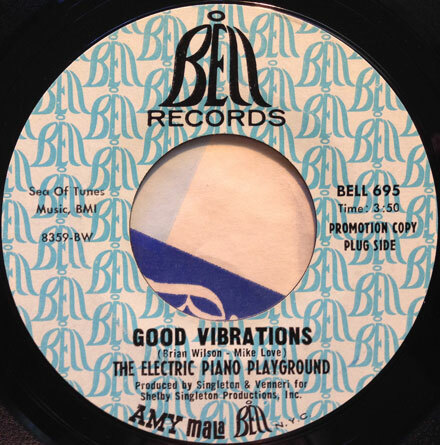 We get things off to a very groovy start with a set of East/West fusion/exotica, then move into some freakbeat and then a set of very cool pop, wherein Jackie and Roy make yet another appearance. Here’s something crazy for you. I picked up the Associated Soul Group LP a while back because a friend had posted their version of ‘Are You Experienced’, mainly because it included a drum break. I’m always game for exploito/covers, so when the chance presented itself, I grabbed myself a copy of the album. What I discovered was that in addition to a couple of groovy instrumentals, there are a couple of excellent garage/psyche tracks as well. 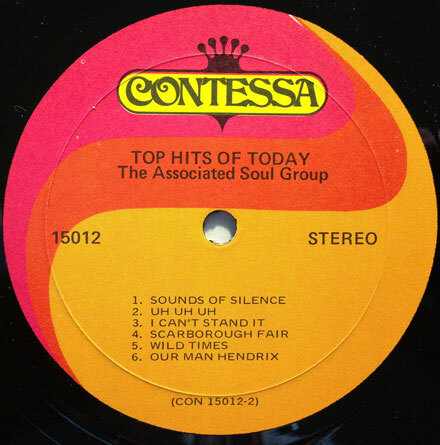 The history/provenance of the the Associated Soul Group is largely lost to the ages, since there probably never was an actual group by that name, and the fact that the music included on the album in question may very well have emanated from more than one source. The tunes I bring you today, my faves from the LP are two great slices of 66/67 garage called ‘Don’t Think Twice’ and ‘Wild Times’. ‘Don’t Think Twice’, which opens with a very groovy guitar line has the slightly polished sound of 66-era Sunset Strip to it. ‘Wild Times’ works a similar vibe, adding in a touch of Paul Revere and the Raiders. Interestingly enough, this very song, (sounding like the same group, though a different recording) was released as a 45 by the Id, of ‘Boil the Kettle Mother’ fame. ‘Don’t Think Twice’ also appeared under the Id name, as well as appearing on an LP by the ‘Projection Company’. I have (and have heard) a bunch of similarly intended albums, and what sets these tracks apart is how good they are, so much so as to be too good (if you know what I mean). It pains me to think of some anonymous bunch of longhairs having offered up their best material, only to have the songs recycled/renamed and stuffed into supermarket and gas station record racks until the record company had managed to squeeze the last drop of musical blood from the stone. 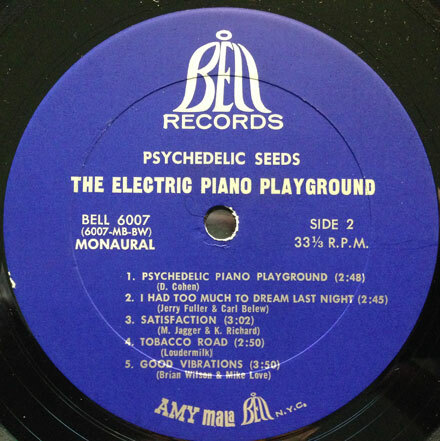 There are some names tied to these sounds, namely Jerry Cole and Paul Arnold (at least as far as writing credit is concerned) but the list of groups in this particular orbit – including the Animated Egg, T. Swift and the Electric Bag, Associated Soul Group, Firebirds, Projection Company – only serves to muddy the water. That said, I do dig these songs a lot, and I hope you do too.